Welcome to Ward 5 Online: Somerville by Design Hosts Upcoming Events! 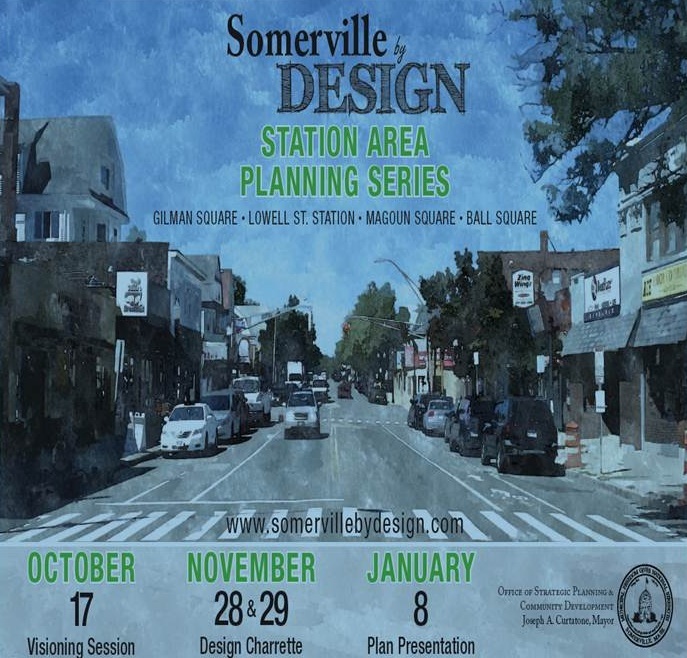 Somerville by Design Hosts Upcoming Events! “Somerville by Design” is the City’s long-range planning & zoning effort to help our neighborhoods get ready for the arrival of the Green Line. A series of meetings is underway for the Gilman Square, Lowell Street / Magoun Square, and Ball Square neighborhoods. At a kickoff meeting in October, more than 70 community members discussed big, broad ideas related to physical planning and private redevelopment. Attendees consistently said that Somerville should work to maintain the great character of the residential neighborhoods around each business district, but should also work to create more opportunities for local businesses and commercial property owners around the future MBTA stations. The City has hired urban design consultants to help our community members visualize positive change in their neighborhoods. These changes can range from public improvements like better lighting or wider sidewalks that handle café tables, to private improvements like storefront renovations or even redevelopment of key properties around the stations. Based on public feedback at our October meeting, the design team is preparing sketches of various improvements around Gilman Square, Lowell Street / Magoun Square and Ball Square. We need your opinions on these ideas, and our designers will even prepare new sketch plans based on your feedback! Between 9:00 am and 4:30 pm on Wednesday November 28th and Thursday November 29th, you can stop by the Armory (191 Highland Avenue) and see the design team at work. Special blocks of time have been reserved for business owners and community organizations on both days from 9am-11am, and from 2pm-4:30pm. Please contact Brad Rawson at City Hall (625-6600 x2518) to schedule an individual session with the designers, which will only take 20-30 minutes. The general public is invited to “Open Studio” sessions at the Armory from 11am-2pm on both days. In addition, everyone is invited to the Armory for a public meeting Wednesday night from 6:30-8:30 pm, and an informal gallery event will be held Thursday night from 4:30-8:30 pm.